Graduating from Durham University with a first-class degree in Biochemistry, Rueben is leveraging his background in science and computer modelling by joining the transportation research team focusing on commercial vehicle electrification. He is currently responsible for Interact Analysis’ research into the hybrid and electric truck and bus industry with a particular focus on the European and North American markets. 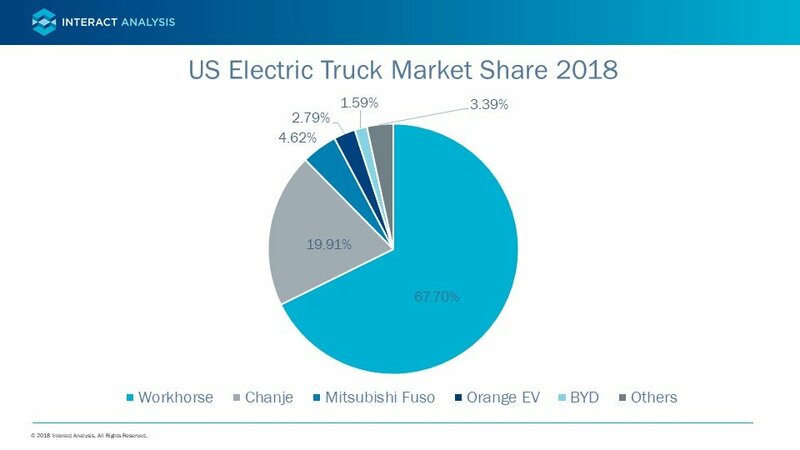 After the success seen in the passenger vehicle market, the move towards electrification is becoming apparent in the US electric truck market. 2018 has been a breakout year for commercial vehicle electrification; with almost every major truck OEM announcing a vehicle launch and many creating dedicated internal divisions to help define their e-mobility strategy. The supplier base is also preparing itself to deliver products ahead of an expected market ramp. Unlike the passenger vehicle market, however, the uptake of electric commercial vehicles is predominantly driven by the total cost of ownership (TCO). Although the up-front cost of electric trucks is greater than that of diesel equivalents, the savings in the cost of electricity and maintenance enables the overall cost to break even some time during the lifetime of the vehicle ownership. The exact point at which the vehicle breaks even, however, is dependent on a number of factors. Firstly, the duty cycle is a key determinant of the TCO since the main cost savings are realised on a per mile basis. The overall cost of an electric truck travelling 200 miles per day will break even with a diesel equivalent model in a shorter period of time compared to one travelling only 100 miles per day. Furthermore, a vehicle which stops and starts on a regular basis can capitalise on the energy recuperation from regenerative breaking while an internal combustion engine (ICE) model is less efficient when performing a stop-stop duty cycle. Conversely, a duty cycle consisting of long stretches of high-speed driving reduces the efficiency of an electric drivetrain while increasing the efficiency of the ICE drive. Secondly, the ratio of electricity and diesel prices dictates the savings per mile and this varies massively by country. In the US, for example, a light-duty electric truck with a 30,000 miles/year duty cycle and a 50kWh battery would take over ten years to reach parity with an equivalent diesel model assuming no subsidies were provided. By comparison, the time to reach parity with an equivalent diesel model in Norway takes just three years. This is because the price of diesel in the US is cheap while electricity prices are relatively expensive and the opposite is true for Norway. That being said, the federal and state subsidies, as well as those from the VW mitigation fund, greatly improves the cost competitiveness of electric commercial vehicles in the US. The efficiency of the diesel engine plays a big part in the time taken to break even. Using the Mitsubishi Fuso eCanter as an example, an increase from 13mpg to 14mpg for its diesel equivalent model results in an extra year needed to break even. If you can sell a truck for a higher price once used, the savings needed to break even will be less. The residual value of electric trucks, however, is the million-dollar question at the minute. Since the first generation models are still to be tested, it’s hard to tell with confidence what the value will be. One way in which the residual value could be increased is by offering battery warranties or implementing battery leasing schemes such as the one provided by Renault. Originally owned by Navistar, Workhorse produces light-duty electric commercial vehicles and has recently been awarded a contract to supply 1,000 electric trucks to UPS. Along with their proprietary HorseFly drone delivery system, Workhorse are looking to revolutionise the last-mile delivery market. Chanje is start-up based in California who – in partnership with the Chinese electric vehicle manufacturer FDG – is looking to provide a holistic, turn-key solution for operators seeking to electrify their fleets. Providing the vehicles, charging infrastructure, grid-management and even decentralised power generation, Chanje is looking to offer an entire system rather than just an electric truck. Mitsubishi Fuso was the first of Daimler’s brands to bring to the market a commercialised electric truck however Freightliner soon followed suit with its eM2 and eCascadia. The eCanter is a medium-duty electric truck aimed at the urban distribution market. BYD has their sight set on the port drayage market. US port yard fleet operators are currently entitled to large subsidies to upgrade their vehicles due to the higher than average age of their fleets and the high levels of pollution found within port yards. Due to the inherent stop-start nature of the drayage duty cycle, the cost competitiveness of electric trucks is improved thanks to the energy recuperation from regenerative breaking. Orange EV, a start-up from Kansas, produces pure terminal electric trucks which qualify for several clean air subsidies. Interestingly, Orange EV offer remanufactured vehicles built from recycled cabs. An Orange EV electric truck costs between $199,950 and $284,950 depending on the specs and whether it’s remanufactured. The competitive landscape is by no means fixed and we expect to see large shifts in market shares in the coming years. Incumbent truck OEMs such as Navistar and Freightliner are currently testing electric truck prototypes which are expected to enter the market in 2019 and 2021, respectively. It’s interesting to note that three of the top five brands are relatively unknown and we expect the number of start-ups in this market to increase. We’ve seen this in China where there’s been a huge proliferation of electric truck OEMs under the protection and financial support of the Chinese government. While there has been a big push for electric trucks in recent years, the US market will largely be driven by subsidies in the short- to mid-term. Owing to the relatively cheap diesel and expensive electricity prices in the US, the cost of electric trucks will have to be comparably lower than most European countries to reach a similar level of cost competitiveness. As a result, there will likely be a lag in the US electric truck market as we wait for the cost of batteries to fall. The TCO isn’t everything however. Germany, which has unusually high electricity prices for Europe, is still one of the leaders for electric commercial vehicles with StreetScooter, a subsidiary of DHL, owning by far the largest market share. Overall, we expect growth to lag behind Europe and the light-duty segment to grow faster than the medium- and heavy-duty segments and subsidies will be key for sustained growth in the short- to mid-term. This mini-report is based on our global hybrid and electric truck and bus market forecast. For more information click here.